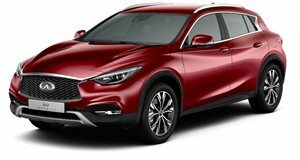 We were extremely excited when Infiniti dropped off a 2017 QX30 Sport in Magnetic Red. When Infiniti first revealed this car as the Q30 in Europe, we were excited that the brand was finally building a car that could please enthusiasts. 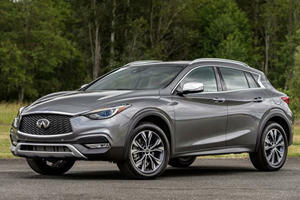 Unfortunately, to cater to US buyers, Infiniti had to call this car the QX30 and market it as an SUV. Make no mistake, this car is more of a hatchback than a full-on crossover, and this is fully apparent when you peel away the badge and see where this car came from. This lnfiniti crossover is actually German. The QX30 is based on a Mercedes-Benz GLA 250. 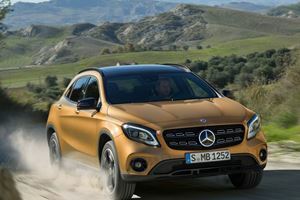 The car is powered by the same 2.0-liter turbocharged four-cylinder engine from the GLA with 208 horsepower and 258 lb-ft of torque going via a seven-speed dual-clutch transmission to either FWD or AWD. Our QX30 was the top-of-the-line Sport model, which is only available with FWD. The Sport also rides on a lower, stiffer suspension that's model specific, giving the Sport a lower ride height that appears more like a hatchback than other QX30 models. 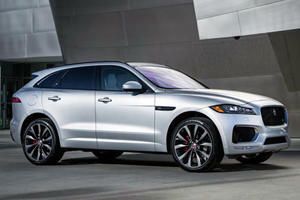 The Sport also looks more aggressive thanks to grey 19-inch wheels with cross-drilled front brakes. The QX30 Sport starts at $38,500, making it the most expensive of the QX30 variants, but oddly enough, not the most highly optioned. Our tester came in at $39,495, but lacked common features like navigation, heated seats, driver-assist or even a leather interior. The Sport starts out as a pretty basic car, but can be optioned with safety features like blind spot warning and adaptive cruise control for $1,200. Leather interior is a $1,500 option, but the base interior is a pretty nice suede mixed with leatherette. What we would have appreciated in our test car was the built-in navigation, which is a zero-cost option on the QX30 Sport. Having to use a smartphone to navigate in a $40,000 car wasn't ideal. Infiniti borrowed most of its interior electronics from Mercedes without too many changes. The infotainment system is extremely basic and really only handles audio functions with no Android Auto or Apple Car Play available. There is some smartphone integration through an Infiniti app that allows Facebook and Google, but it was incredibly difficult to pair and was extremely useless while driving. We wouldn't recommend the QX30 for someone who likes to have the latest and greatest tech features. The QX30 does have a few cool options like an around-view camera system, but this system is available on many Nissan cars as well. The QX30 is definitely not a tech-lovers dream, but caters to people who like to drive. It held its own on a canyon road, and while it did roll around more than a hatchback with a lower center of gravity, it wasn't bad in the handling department. The back rotated well under hard cornering, which made the car feel a bit unstable when pushing it hard. We would have preferred a performance AWD system, and it seems odd that Infiniti only offers the Sport with FWD. The interior of the Sport comes with the same seats that you get in the GLA 45 AMG, but they don't really offer enough bolstering to hold you firmly in the seat. Speaking of the GLA 45, we would absolutely love to see Infiniti get permission from Mercedes to build the QX30 with the 375-hp version of the 2.0-liter engine with AWD. Even with "only" 208 hp on tap, we weren't exactly begging for more power. The QX30 Sport hits 60 mph in 6.2 seconds, which is pretty quick. Off the line, the car doesn't feel particularly fast, but the 2.0-liter engine pulls extremely well once the car is in motion. We were frequently able to pass people on the highway while barely exceeding 2,000 rpm. The QX30's engine remained extremely silent while gaining speed and we have to give credit to Infiniti for tuning this engine. It is one of the smoothest four-cylinders on the market. Every automaker says that their turbocharged four-cylinder has the smoothness and feel of a V6, but in this case we think that Infiniti (or actually Mercedes) has actually nailed it. The paddle shifters on the seven-speed dual-clutch are pretty fun to use and very responsive. It isn't the fastest shifting dual-clutch, but it is certainly passable. We only experienced minor annoyances with the transmission on very steep hills on California mountains. The transmission didn't really know what to do when traveling down hill, causing some annoying engine drone. Other than this minor fault, the dual-clutch is fantastic in everyday traffic and for sporty driving. We also highly enjoyed the QX30's three distinct drive modes: Eco, Sport and Manual. Eco keeps the car at low revs, without making the car feel sluggish on passing maneuvers. Sport lets you wind the engine out more with higher shift points and really lets you enjoy that turbo goodness. Manual lets you take full control, and we actually used it several times in traffic without any issues. Most manual modes are annoying to use when downshifting, but the QX30 could actually be shifted comfortably in stop-and-go traffic. We loved how different these modes made the QX30, but the method of switching between them was extremely annoying. The only way to cycle between them is by pressing a tiny button on the shifter, which is buried low in the cabin. The button was very difficult to locate while driving, and needed to be pushed three times to cycle through each mode. The entire cabin of the QX30 was really an ergonomic mess. The climate controls are also buried low down on the dashboard, making them very difficult to use while moving. We never got used to the Infiniti controller that's changed slightly from the Mercedes Command system. The QX30 gets a touchscreen in addition to the control knob, and we mainly relied on that instead of the confusing knob. The QX30 is really a mixed package. We really enjoyed the way it drove, but the lack of high-tech modern features made it feel very dated on the inside. Infiniti has done a good job taking the GLA and making it unique. In our opinion, the QX30 looks more aggressive than its Mercedes counterpart, but we wish that Infiniti would offer it with the more powerful 375-hp engine. That engine would make this the perfect SUV for enthusiasts, but as it stands the QX30 is a bit lacking in the fun department. Some updates on the interior would also really help this SUV sell to non-enthusiasts. These SUVs won't make you feel like you've given up on life. The dealership objected. Infiniti Corporate said otherwise.